we are headed to Nancy Carter’s Artist-in-Residence show at Sugar Space. Rachael Shaw is definitely writing a review of the performance Saturday. Feel free to send your own review to lovedancemore@gmail.com of the performances tonight, tomorrow or Sunday. Or comment on Rachael’s thread. the show is at 8pm all three days, $10 tix online (thesugarspace.com) $12 at the door. Last night’s Symposium, “The Revolutionaries: Vanguards of the 1960’s,” hosted by Repertory Dance Theatre and Utah Humanities Council, was a college lecture on steroids. Five speakers—Miguel Chuaqui, Sarah Hollenberg, Satu Hummasti, Alex Caldiero and Linda Smith— taught the audience about avant-garde’s place in culture for dancers, painters and musicians. Least adherent to the lecture format was the first speaker Caldiero, who presented Dada, the avant garde poetry form, through a mash up of famous poets’ writings. Sometimes songlike, sometimes a screaming rush of incoherent ramblings, Caldiero made avant-garde at once slightly off putting and intensely interesting. The other speakers maintained a lecture/PowerPoint format that was less exciting but no less interesting. Speaking of musician John Cage, artist Donald Judd and dancers Yvonne Rainer and Merce Cunningham, the cultural movement of avant-garde was presented in all forms. This symposium worked as a preview and teaser for RDT’s performance “Vangaurd” which will be performed at the Rose Wagner October 6-8. Audience members who attended yesterday’s free event will have the added pleasure of understanding the context in which the dances in the show were created. RDT dancer Nicholas Cendese performed an excerpt of “Trio A” by Yvonne Rainer. As he danced, Satu Hummasti spoke of the process and significance (or lack thereof) of his movements. It was an inside look at the piece that will be much appreciated by audience members who see the full piece next weekend. Were any other loveDANCEmore readers in the audience? I would love to know what you thought of the event. Without a discussion afterwards (which was planned but cancelled because of a late start/late ending) thoughts are reeling, with no one to bounce ideas off of. Bounce ideas here, please! Nancy Simpson Carter is excited to be premiering “A TALE FROM THE LAND OF FRIGHTFUL DREAMS” with her performance company Rumble Motion Jawbone at Sugar Space this weekend. 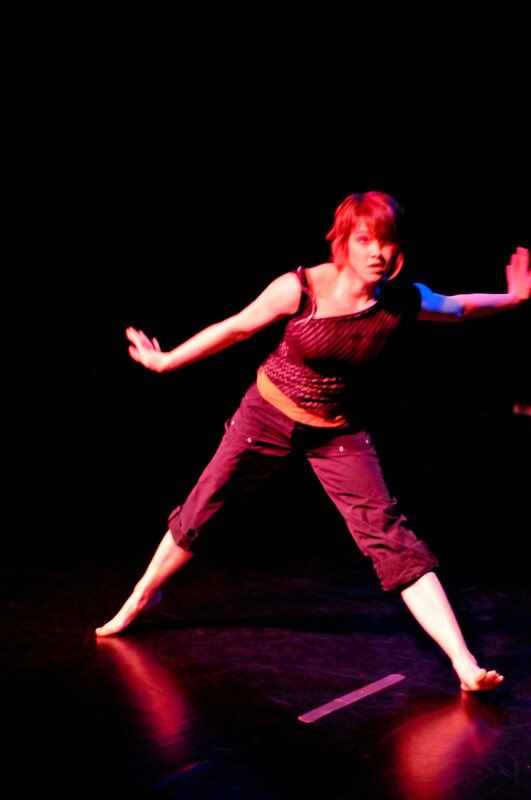 She has worked long and hard as an artist in residence at the space and promises that “Rumble Motion Jawbone will blur the limits of codified dance forms.” She works with performers that have trained in a range from circus to Butoh. The piece began as a duet at Fall Mudson and has expanded to include more characters and scenarios. In addition to her work she will premiere “the New Blood Dance Project” in which a “non-choreographer” has tried his hand at making a dance with professional dancers in the city. You can check all this out on Friday, Saturday or Sunday at 8pm. Sugar Space is at 616 E. Wilmington Ave & tickets can be ordered beforehand for $10 (thesugarspace.com) or $12 at the door. and in NY Claudia La Rocco writes about the value of interdisciplinary festivals: http://www.nytimes.com/2011/09/25/arts/dance/time-based-art-festival-in-portland-oregon.html?_r=1&ref=dance. for the Tribune readers. please don’t come to the Masonic Temple tomorrow because there is no Mudson. in the spring there will be more. forever and ever there will be more. just not every week. Below are Sofia Strempek’s thoughts on Polychromatic. Feel free to comment on the thread with your own review and check out Kathy Adams’ review in the Tribune as well: http://www.sltrib.com/sltrib/entertainment/52630658-81/dancers-company-polychromatic-ririe.html.csp#.Tn0SUBCdSZw.facebook. There was a moment when Ririe Woodbury’s future seemed unclear. With directorship switching hands from one Woodbury to another; three new dancers to replace respected and much loved company members; a new Artistic Director, the amount of change which an organization can withstand was tested. RW’s first show of the fall season, Polychromatic, transitioned seamlessly from what was to what is, an example of fine leadership and smart artistic decisions. Hiring this group of six dancers was Good Decision #1. I have never perceived Ririe Woodbury as a core group- they have always seemed to be parts that made a whole. At Polychromatic, most notably in Brook Notary’s Grid, semblance brings trust and unspoken relationships to the stage. Not to say that the group is homogenous. Jo Blake, RW’s longest-employed dancer, approaches movement with attentiveness, and then slaps or elongates that movement with all of his might. A sharp and powerful dancer. Elizabeth Kelley-Wilberg and Tara McArthur, who have been with Ririe Woodbury since 2006 and 2010 respectively, were individually alluring and eye catching. No distinctions of seniority are evident within the choreography or performance, however. The three established RW company members share the stage wonderfully with all of the new blood- Alexandra Bradshaw, Brad Beakes and Bashaun Williams. The company is one entity: fresh, invigorated and bold. Each of the four pieces in Polychromatic called for all six dancers. (I can’t imagine running that marathon- it must be deliciously exhausting). Rehearsals then, would have called for everyone to be in the studio together for much of the creative process. Such close quarters must have created the bond which is so richly experienced onstage. Artistic director Charlotte Boye-Christensen keeps dancers off balance in her work Push. Often, the only reprieve from falling is the support of another body. There is a sharing of weight. In one ‘gasp’ moment, Blake and Kelley-Wilberg press forehead against forehead, balancing one another, as their legs reach backwards, with the shared push of this precarious body part. Elegant stillness seems to pause the moment, as the position enervates itself. Then the balance is disrupted and Kelley-Wilberg heads face first into the floor, only to be caught by Blake inches away from a face plant. Blake stands over her extended figure, holding her aloft. They sway slowly, each dependent on the other for support. If it were up to Boye- Christensen, all six dancers would be getting their knees replaced next year. Her signature choreographic style often takes place at a low level, with twists and jutting limbs originating from a deep plie. There is grittiness to this movement that makes the dancers cool, a dirtiness made all the more enticing when a slow moment reveals their underlying elegance. When a prop upstages a performer, something is wrong. How, then, did the prominence of string and puffs of powder in Brook Notary’s Grid not overshadow the company? To explain it most simply: progression. Notary heightened my attention at the beginning of Grid with a dancer’s quick touch of a string, and the resulting billow of a powder. The stage is made into the world’s most giant cats-cradle game; five or six supple ropes extend tautly from left stage to right. They seem to be coated with a flour-like substance and with the slightest teasing touch the powder blooms softly into the air. This is not a trick. Notary does not give up on the choreography once the ropes inevitably lose their coating. The ropes become less of a prop and more of a barrier; dancers struggle to extend themselves past their stretching but still unbreakable lines. Thankfully, there is no melodrama in “Grid.” Even as dancers push the constraining ropes to their limit, it is with softness or quiet strength. Polychromatic highlighted the maturity of the company; even their youngest dancers (Williams graduated from the University of Utah last year) danced with presence and intention that can sometimes fall to the wayside in the midst of such a transition which RW experienced this year. With maturity comes the ability to laugh at one’s self. Just a glance at Blake’s costume- silver lame booty shorts- in the self aware, humorous 80’s Night choreographed by Larry Keigwin, will confirm this. Ririe Woodbury’s Polychromatic was an exciting spectacle, and its December show Prism cannot come soon enough. why aren’t any of these people dancers? usually one or more dancers/choreographers can be found on this list. Below Kitty Sailer submitted her thoughts about the Mudson fall premiere. Remember you too can submit your own thoughts about this or other shows in SLC simply by e-mailing lovedancemore@gmail.com like Kitty did. The second season of Mudson opened last night to great fanfare, as Ashley Anderson, the patron saintress of Community Dance Events, welcomed us back to monthly works-in-progress showings at the Masonic Temple. Actually, Ashley wasn’t feeling that well, so some random girl welcomed us back. Anyway. The night opened with Juan Aldape’s piece, featuring Sam Hanson, who is definitely not an ex-dancer. The structure of repetition and reversal was simple but solid. There was no musical accompaniment to distract from the sparseness of the work. I wasn’t sure of the “why” of this piece, but the “what” was very clear. Leah Nelson, recent transplant to Salt Lake City, opened her piece with several minutes of pleasantly bizarre hand-wobbling. She held her arms up very high, and then her hands flopped back and forth at the wrists until I was sure that they would flop off. I had a great side view of this entertaining 180 degree wrist mobility. A well known Edith Piaf song, in which that great French singer insists that she will not regret anything, accompanied this section. Afterward, Leah launched herself into a richly varied, intimately scaled movement and text exposition of her move to Salt Lake. The movement truly drew me in, with subtle quirks, twists, and plunges. The text, thoughly elegantly spare, set me back from the dance somewhat. This is more of a confession than a critique. The text felt alienating to me, simply because it told me that Salt Lake was “my” city, and that “my” city didn’t leave room for Leah. This was probably the most provocative element of the dance for me; suddenly I felt that I was no longer the recent transplant, accepting condolences for my recent move to a state that many people gently ridicule. Suddenly I was the townie. Aniko Safran presented a very short screen dance. Aniko’s work is always intriguing, but I won’t tell you too much because you should go see for yourself. She will have films at all the Mudson showings this fall. It is fabulous that the fields of dance and film are coming together to create a new art form. It used to be called dance for the camera, or dance film, but now it is called screen dance, and you should really check it out. Then you can say that you were there at the beginning. The evening closed with Erica Womack’s work. This piece, presented in three sections, will continue to evolve, headed toward a final showing at Sugar Space in February. In the true nature of works-in-progress showings, Erica had an opportunity to present her unfinished dreamings in front of a live audience last night, to see how her dreams behaved on display. From the response of the audience, I would say they behaved very well. Laja Field and Efren Corado performed memorable solos, and a duet with Anne Marie Robson and Amy Fallz showed promise as well. I am excited to see what happens with this piece in the coming months. Kitty Sailer is a MFA candidate at the University of Utah working on a thesis with less than conventional audience arrangements. inFluxdance. a party and a show. When you are handed a gin & cucumber cocktail the moment you arrive at a party, the night takes on a certain glowing sheen. This welcoming gesture at a recent fundraiser for inFluxdance may not be par for the course, but it’s one example of what standards the dance company holds itself to. inFluxdance’s fundraiser party, held this past weekend, was modern and stylish; although co-director of inFluxdance’s Alysia Woodruff kept the event relaxed by wearing the Dickies™ coveralls that the company has made their go-to-costume. Woodruff kept the party on track and focused on the purpose of the evening by directing guests attention to a short movie about the companies past exploits and future ambitions. She encouraged the audience to eat well, and possibly donate after their stomachs were sated. Amy McDonald Sanyer, founder and director of Brolly Arts, spoke about her mission to support inFluxdance. Brolly, a British slang term for umbrella, is, appropriately, an umbrella organization which supports artistic development (including the development of inFluxdance). It was so amazing to hear Sanyer talk about her passion for other people’s passions. Her career is to help artists become successful. She is willing, in fact eager, to do the dirty work for artists. I was immediately enamored. inFluxDance is slowly making Utah its’ home base, and looking at the audience the company is generating (the evening was moderately attended but guests were appreciative of the work and seemed intent on supporting inFluxDance) it will be a good fit. Woodruff and other members/co-directors of inFluxdance leave for Spain on Friday to present their work. Assuming Spain doesn’t coax them to lengthen their stay overseas, inFluxdance will perform at The SugarSpace November 10-12. “We plan to have it be a huge inclusive celebration of all the independent companies and community artists,” Woodruff wrote to me via email. “We feel like everyone needs to come together to support dance for social change,” she continued. The performance sounds like it has the makings of another classy event.